We’ve witnessed several Formula 1 road shows courtesy of Renault, BMW, Williams, and Ferrari in the past and Redbull have been quite active in that domain too. There have been F1 ice sculpture replica’s, grass hedge replica’s, tin can replica’s and so much more. Formula 1 cars have been driven on public roads, in the snow, and in Salt Lake City for a World Speed Record with Honda. 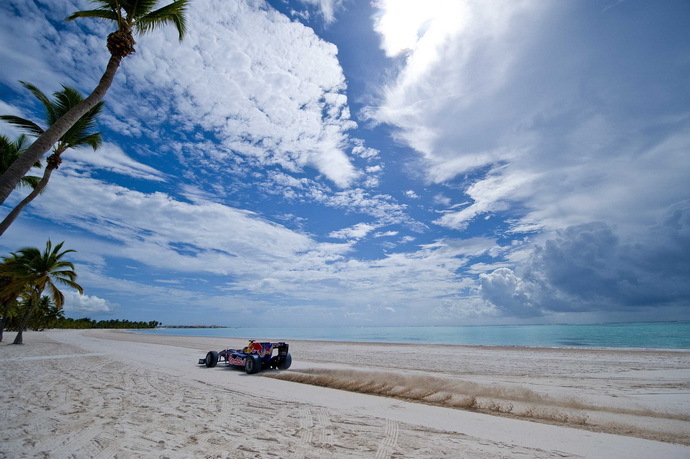 Redbull have now taken things a step further.. to the beach. 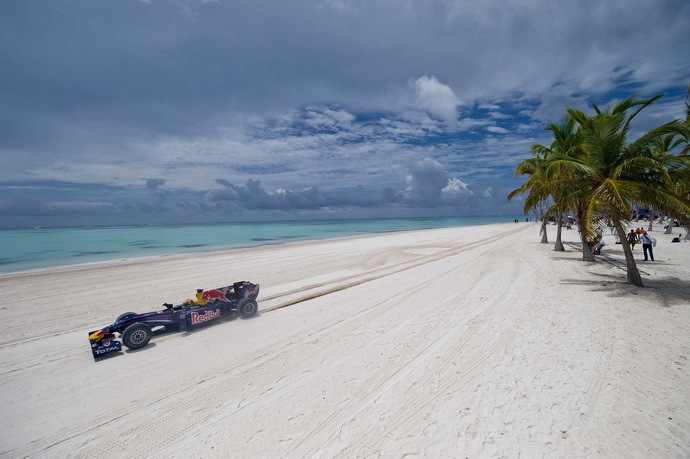 Driver: Jamie Alguersuari, Scuderia Toro Rosso (Redbull Racing B-Team). 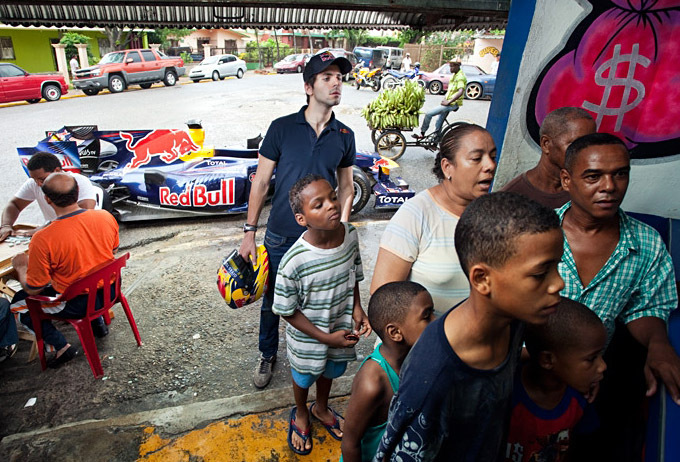 The Redbull Racing F1 Team took a trip down to the Dominican Republic as part of their numerous PR activities. They visited the Juanillo Capcana Beach where a series of low-speed runs were conducted. It caused much more of a scene than ever before. I mean, see for yourself. What would you have done if such a sight was part of your reality? I’m sure more than a few thoughts are flooding through your mind right now. An F1 car in water? Is this their 2010 racer? It can’t be. How did the sand damage the car? If I am not mistaken, that looks like their 2010 racer. Their incredibly fragile on brakes and anti-roll bars racer. This is my fairly educated guess.. to the questions I asked myself when enjoying the Beach GP. 1. 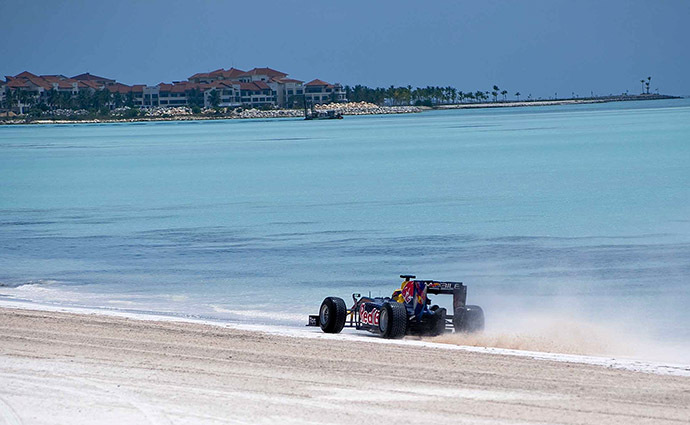 Redbull Racing have a boatload of money to spend – even if it means mechanically damaging one of their cars for a solid day of brand visibility. Redbull are all about big stunts and eccentric activities that nobody even thinks to match. 2. The water should not be much of a problem. 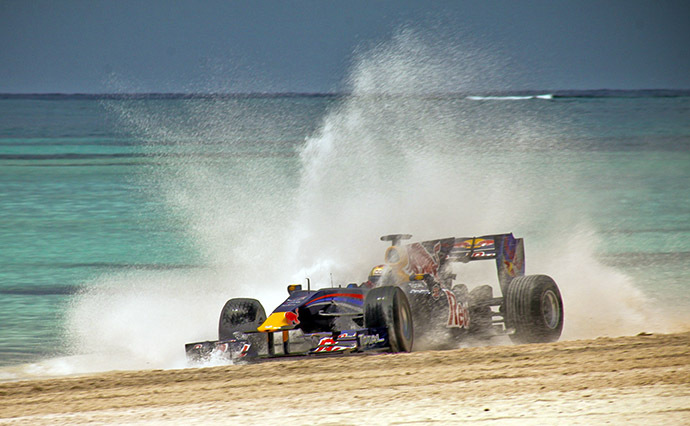 F1 cars can handle water. Please shuffle back to the Malaysian Grand Prix of 2009 where an enormous monsoon of a water storm cut the race short. Fine, it wasn’t a sea of a storm.. these cars can’t handle bodies of water. But then again, an F1 car’s intake system is right above the drivers head, far from drowning in salt water. 3. Yes, sand and salt water might have managed to creep up into the engine manifold and in between the suspension. So what. They’ll live. They’ll live and begin smiling at the amount of buzz a day at the beach created. Imagine driving by a kiosk with an F1 car parked outside it. And what the hell is Jamie looking at? They’re all looking the other way!